Resazurin Cell Viability Assay offers a simple, rapid, reliable, sensitive, safe and cost-effective measurement of cell viability. This kit performs at least as well as other commercial resazurin-based cell proliferation assay kits such as alamarBlue® or CellTiter-Blue®. Can the ViaFluor SE cell proliferation dye stock solutions in DMSO be stored after reconstitution? What is the expected expiry? The ViaFluor® SE dyes are susceptible to hydrolysis. Ideally the DMSO stock solution should be prepared on the day of use, with the intent that each vial supplied is for single use. If smaller aliquots are desired, it would be best to aliquot the initial DMSO stock, at the time of reconstitution, into single use quantities and store at -20C, protected from light and moisture (desiccated), for up to a month. However, activity may be reduced over time. The dyes should only be added to aqueous buffer immediately before staining. The aqueous solution cannot be stored for reuse. Is staining with the Viability/Cytotoxicity Assay Kit for Bacteria Live & Dead Cells (cat. # 30027) compatible with subsequent fixation with paraformaldehyde (PFA)? Fixation is not recommended after staining with the Viability/Cytotoxicity Assay Kit (cat. # 30027) as the dead cell dye, EthD-III will transfer to all cells and not maintain dead cell-specific staining. Our Live-or-Dye™ NucFix™ Red (cat. # 32010) is a formaldehyde-fixable dead cell dye that can be used in bacteria. Viability qPCR (vPCR) can be an alternative strategy for quantitating live and dead bacteria. Using dead cell-specific dyes, PMA (cat. # 40019) or PMAxx (cat. # 40069) that covalently modify DNA (of only dead cells) after photo-crosslinking, a simple quantitative PCR (qPCR) amplification is used to selectively amplify live-cell DNA. Learn more about the vPCR technology. What is the difference between MTT, XTT and resazurin? MTT and XTT are colorimetric based assays, while resazurin can be measured using colorimetric or fluorescence detection. MTT is not a soluble product, so the cells must be lysed to solubilize the formazan salt before absorbance can be measured. XTT and resazurin do not require cell lysis, allowing kinetic monitoring of the same samples at different timepoints. Resazurin Cell Viability Assay offers a simple, rapid, reliable, sensitive, safe and cost-effective measurement of cell viability. This kit performs at least as well as other commercial resazurin-based cell proliferation assay kits such as alamarBlue®, PrestoBlue®, or CellTiter-Blue®. 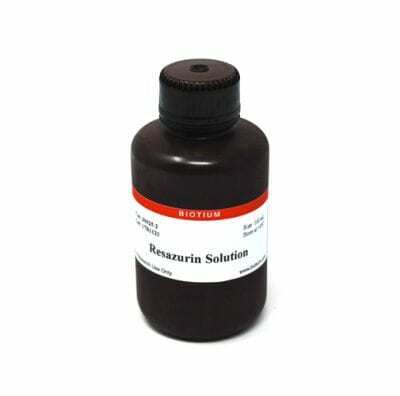 Resazurin detects cell metabolic by converting from a nonfluorescent dye to the highly red fluorescent dye resorufin in response to chemical reduction of growth medium resulting from cell growth (1-3). Continued cell growth maintains a reduced environment while inhibition of growth maintains an oxidized environment. Reduction related to growth causes the redox indicator to change from oxidized (nonfluorescent, blue) form to reduced (fluorescent, red) form. The fluorescent signal is monitored using 530-560 nm excitation wavelength and 590 nm emission wavelength. The absorbance is monitored at 570 nm and 600 nm. The fluorescent or colorimetric signal generated from the assay is proportional to the number of living cells in the sample. Resazurin solution is supplied ready-to-use in 25 mL (2500 assay) or 100 mL (10,000 assay) sizes. alamarBlue is a registered trademark of Trek Biosystems. CellTiter-Blue is a registered trademark of Promega Corporation. PrestoBlue is a registered trademark of Thermo Fisher Scientific. 1. Tottey, S., et al. Extracellular matrix degradation products and low oxygen conditions enhance the regenerative potential of perivascular stem cells. Tissue Engineering doi: 10.1089/ten.TEA.2010.0188 (2010). 2. Kanagaraj, R., et al. RECQ helicase associates with the C-terminal repeat domain of RNA polymerase II during productive elongation phase of transcription. Nucleic Acids Research doi:10.1093/nar/gkq697 (2010). 3. Gustafsson, A., et al. The antimicrobial peptide LL37 and its truncated derivatives potentiates proinflammatory cytokine induction by lipoteichoic acid in whole blood. Scandanavian J. of Clinical & Lab. Inves. DOI: 10.3109/00365513.2010.521255 (2010). 4. Muzumdar, R., et al. Acute Humanin Therapy Attenuates Myocardial Ischemia and Reperfusion Injury in Mice. Arteriosclerosis, Thrombiosis, and Vascular Biology DOI:10.1161/ATVBAHA.110.205997 (2010). 5. Tottey, S., et al. The effect of source animal age upon extracellular matrix scaffold properties. Biomaterials doi:10.1016/j.biomaterials.2010.09.006 (2010). 6. Sarker, S., et al. Microtitre plate-based antibacterial assay incorporating resazurin as an indicator of cell growth, and its application in the in vitro antibacterial screening of phytochemicals. Methods 42(2):321-24 (2007). 7. Petrenko, Y., et al. The Reduction of Alamar Blue by Peripheral Blood Lymphocytes and Isolated Mitochondria. DOI612.112.94:576.311.347 (2005). A convenient assay for quantifying apoptotic (green), necrotic (red), and total (blue) cells within the same cell population by flow cytometry or fluorescence microscopy. These kits provides two apoptosis markers, our novel NucView® 488 Caspase-3 Substrate and Annexin V conjugated with your choice of red or far-red dye. The kit is used for studying two important apoptosis events, caspase-3 activation and phosphatidylserine (PS) translocation.